This top down sock puts a “twist” on the classic bamboo pattern. A twisted cast on edge begins the graduated bamboo design that is also featured on the heel flap. Mystery Sock #15 unveiled in June 2009 and knit woth Alpaca Sox yarn by Classic Elite Yarns. 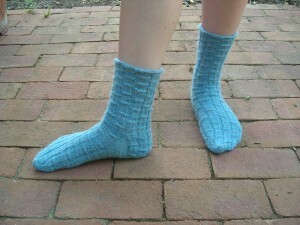 I would like a good pattern for a child sock, girls age six. also a pattern for girls age two, or how many stitches would I cast on for these ages, thankyou so much, I’m new at this..